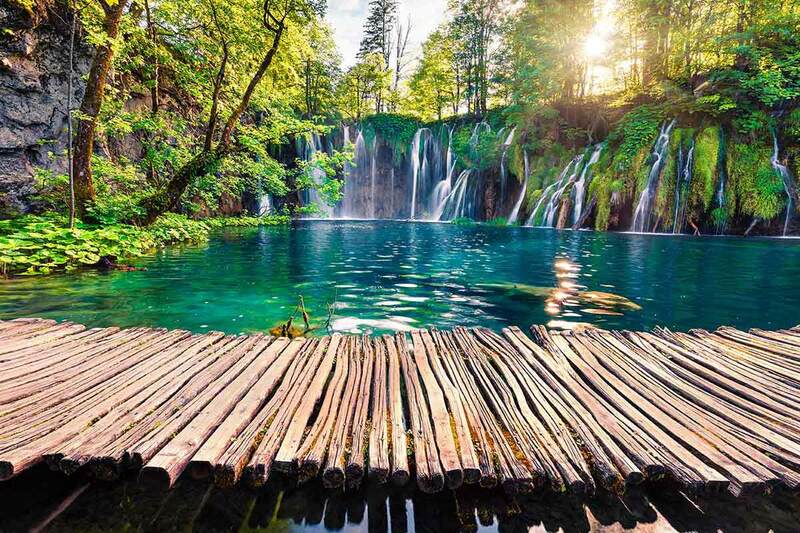 When you start planning your holidays in Croatia, Plitvice lakes should be on your bucket list. To ensure an unforgettable day for you we have prepared some inside guide tips to help you to get more familiar with this incredible place. 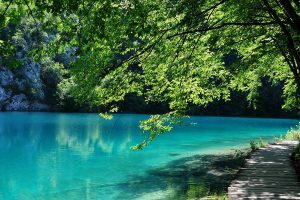 Assuming that you are constantly searching for incredible lakes photos and can’t wait to be there, we have prepared some information that would help you to prepare in best possible way. 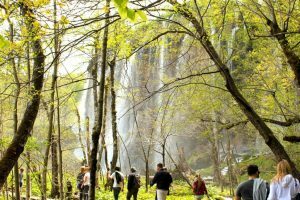 National Park is open during the whole year but the best period to visit this pearl in the middle of Croatia is from Spring to Fall. 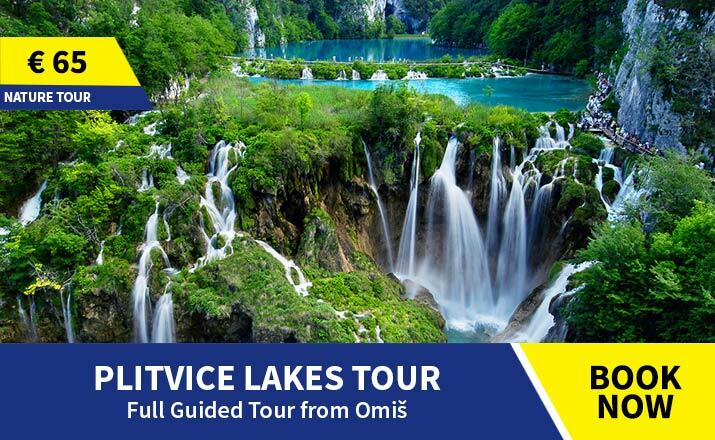 In this period we are operating our Plitvice lakes tour every day, Monday to Sunday, including holidays…and providing the best route inside the Park. Before you take your first step on the wooden paths and becoming one with nature you should be well prepared to make your tour more enjoyable. 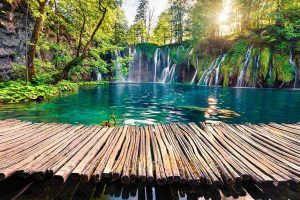 NP Plitvice lakes is a natural reserve divided in two parts; Upper lakes and Lower lakes which are connected with over 90 spectacular waterfalls. 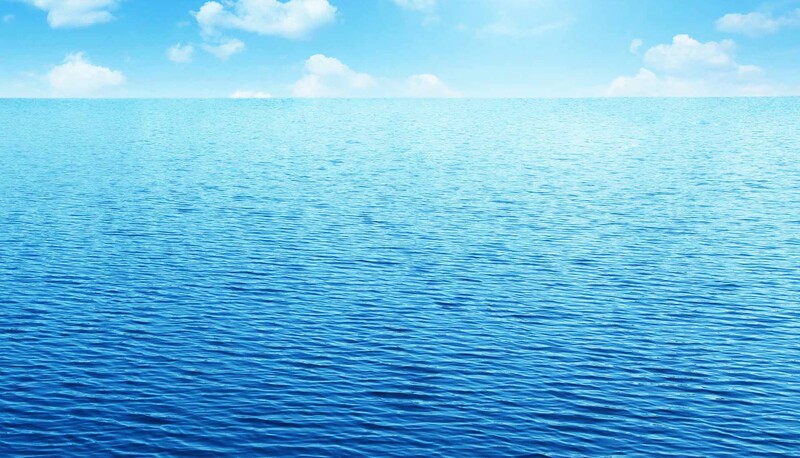 It is a UNESCO World heritage site and swimming or fishing is strictly forbidden. The National Park consists 16 picturesque lakes which are constantly changing its color due to weather conditions; Prošćansko Lake, Ciginovac, Okrugljak, Batinovac, Veliko and Malo Lake, Vir, Galovac, Milinovo Lake, Gradinsko Lake, Bukovi, Kozjak, Milinovac, Gavanovac, Kaluđerovac and Novakovića brod. 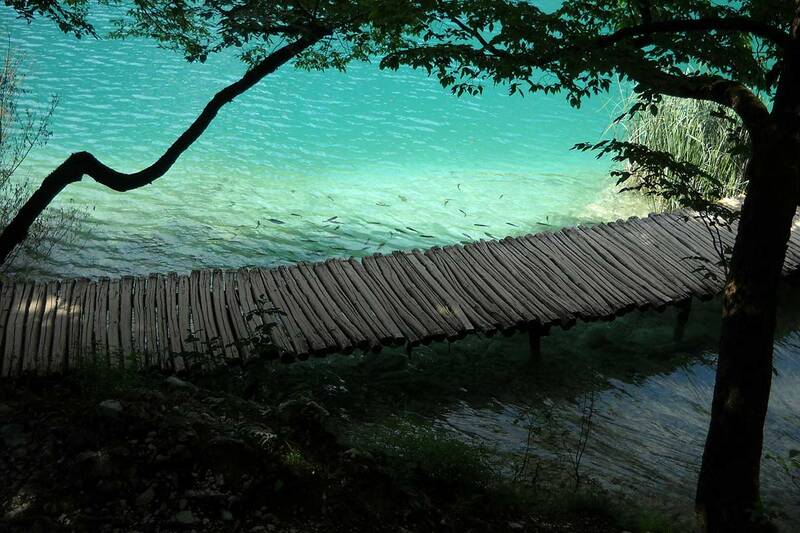 All of the lakes are surrounded by cool forest, long trees, wooden paths and bridges. National Park is very reachable, it lies on the most important traffic route in Croatia so even they are in the middle of the country it’s very easy to get into the Park. The falls never look the same, water is constantly changing course, day to day, hour to hour. Hydrography is the main reason for beauty of this Croatian phenomenon. How to get to the National Park? The distance between Split or Omis and the National Park Plitvice lakes is about 250-275 kilometers respectively and there are plenty of ways to reach the Park. 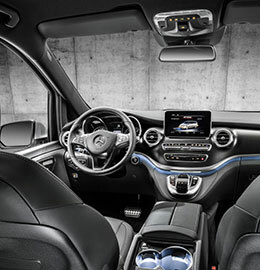 Traveling from these destinations to the lakes is very easy so you just need to choose a transportation that suits you best. Since there is no possibility to arrive by airplane or by train in area that is especially close to the Park, you should be prepared to take some time on your vacation to visit this piece of heaven. If you have your own car, the fastest route for getting to the lakes is by straight forwarded drive along the highway. Travel time from Split and Omis to the National Park is about 3 to 3.5 hours. Otherwise you can travel along the Adriatic coast and do a stopovers in nearby cities. Local buses are available from main bus terminal in Split, in the city center. It is a cheapest way to visit the lakes by your own, but usually involve a lot of travelling in one day. And you certainly want to make the most of your precious vacation time. Best way to get the most of the lakes in just one day is to book a tour with local tour operator. Departure time for Plitvice lakes is 7:30 in the morning but as soon as we arrive inside the Park you’ll be convinced why was worth to woke up early. 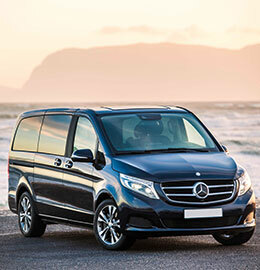 Our guide will pick you up from the meeting point in our agency and accompany you to the bus. You will reach National Park around 11AM after approx. 3.5 hours highway ride in our luxury vehicle. It is always better to avoid the crowd and be one of the first visitors on that day. Be an early bird, you won’t regret it. Tickets cannot be bought online and there could be lines, especially in high season but our tour guide will buy it for you. With his license he is allowed to buy tickets for the whole group without waiting. Each ticket includes panoramic boat ride from Upper lakes to Lower lakes and train ride. They are great way to break up your walk a little bit. Once you get your ticket there is no more fees for you. There are two main entrances to the National park. 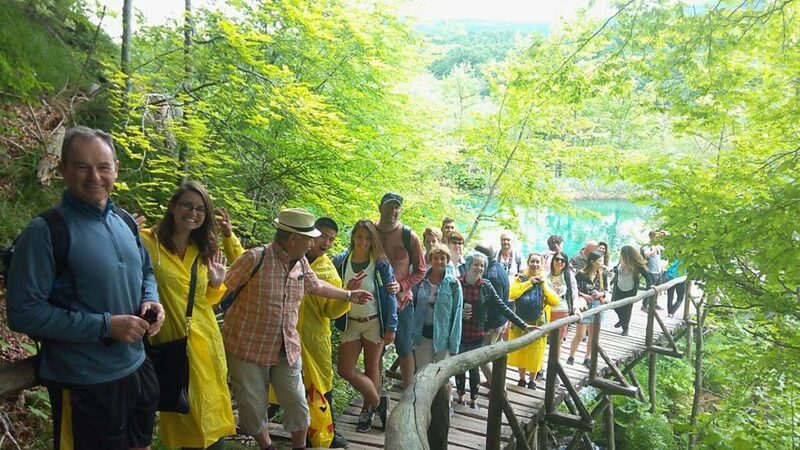 We are starting the tour from Entrance 2 which is less crowded (next to the hotel Jezero) and walking down to Pier One from where we are going by boat over the Lake Kozjak and going to Upper Lakes. Before getting into the boat line you can grab some snacks and water on this area or use toilet. It is a circular tour and the best combination of existing routes which gives to our guests best experience of the Park. After the small break we continue to the ST2 (train stop) which leads us to Upper Lakes and Great Waterfall. You should be prepared for approximately 4 hours of guided walking inside the Park. Don’t worry, it’s not too long. 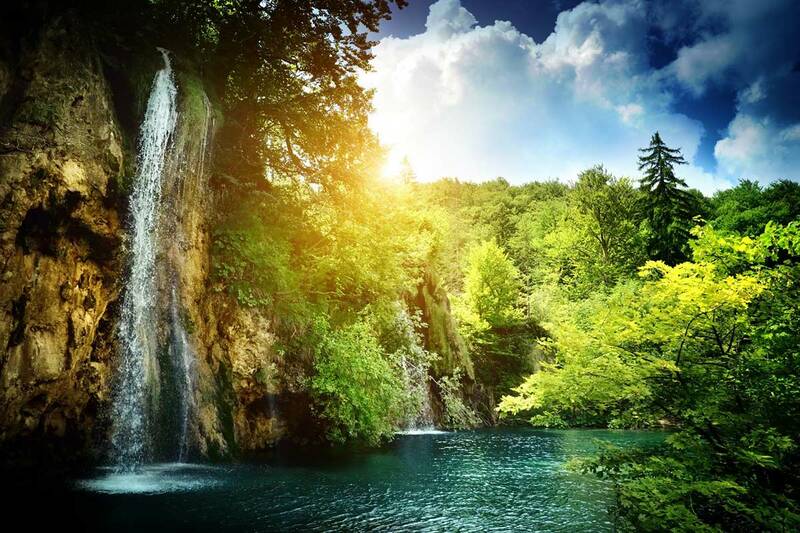 You will surely enjoy it and want more time to spend in this paradise on Earth. Both entrances have souvenir shops. No need for shopping on the beginning of the tour and carrying more stuff inside the Park. You can do it after the tour. 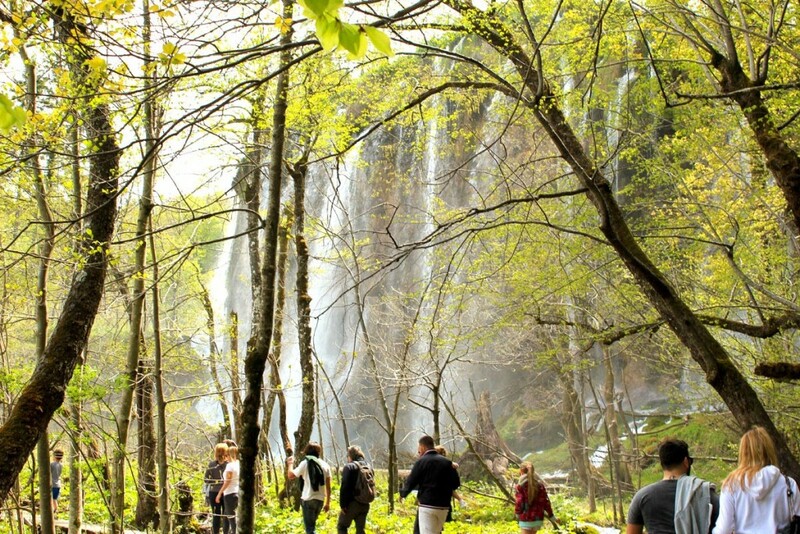 Since Plitvice can be crowded in some part of the year we decided to provide full experience to our guests. We want to make sure that you are up to our guide’s storytelling while you are taking breathtaking pictures of stunning nature. Your pictures would speak volumes. Each of you will get ear pieces and your journey through the Park can begin…and sometimes you need to decide to put your camera down. Take a mental picture, hear the sounds of the nature and enjoy. Is the route strenuous and tiring? Not at all. 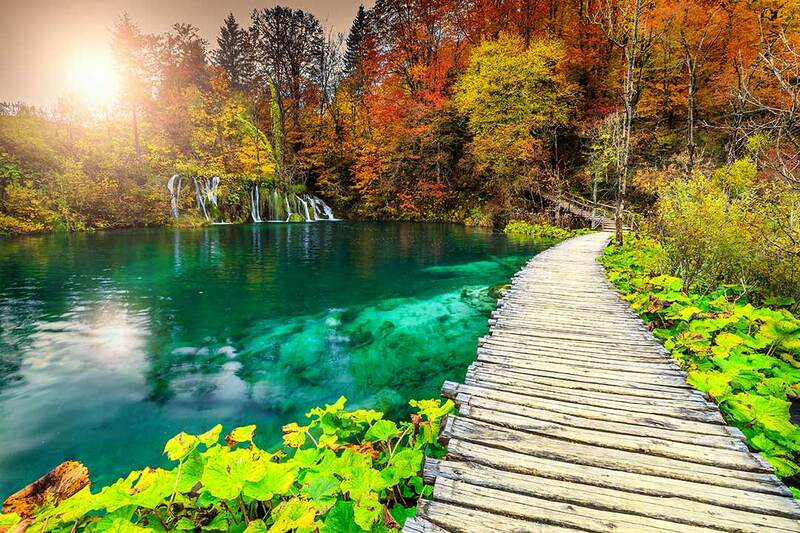 Plitvice National Park suggests few trails that individual visitors can follow. 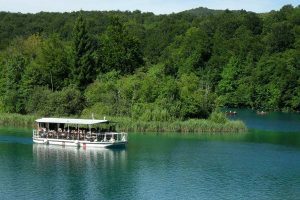 We took the best from all suggested trails so our route covers all main areas; Upper and Lower lakes with panoramic boat ride and train ride included. The Park is very well marked and offer the different routes for different kind of nature lovers. Our route includes easygoing guided walking with few short stops. Keep in mind that the Park is really huge and that suggested trails of NP „Plitvička Jezera“ require more time of hiking and exploring. 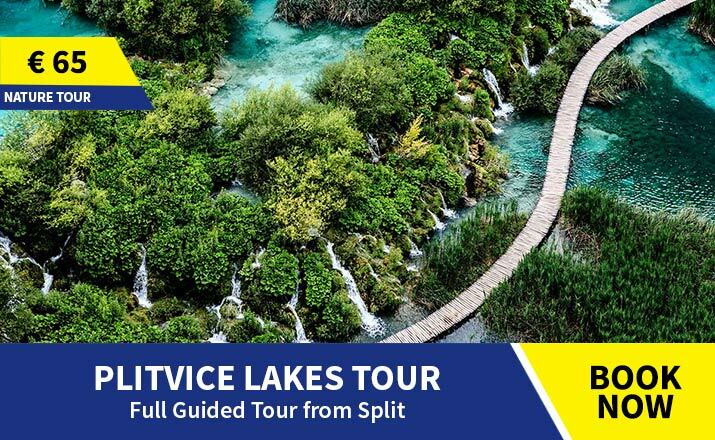 Our trail is the most optimal one for the day trip from Split or Omis to Plitvice lakes where you are able to visit the most of the Park in one day. Our guided tour covers around 7 km of National Park so sneakers or hiking shoes are the best option if you really want to enjoy walking through wooden paths and trails. Flip flops and high heels are not welcome. In case of the bad weather we are providing rain ponchos and you don’t need to be burdened with carrying umbrellas or any unnecessary stuffs with you. Plan to bring some small backpack with water, sunscreen and camera. Make sure that your battery is fully charged ☺ Take a hundred of photos and make your family and friends jealous. Depending on the season you’ll be visiting lakes, bring some light jacket or cardigan with you. The temperature constantly changes by a few degrees depending on your location inside the Park and the season you decided to visit it. National Park is on the board between two climate area and can be chilly in the late afternoon during pre season and postseason time. On your way to the National Park we will make a short stop where you can refresh yourself and get some snacks and on the way back to Split and Omis, there is a lunch break provided in one of the traditional local restaurants. It’s just a game of beautiful colors of nature. Park is open all year round and lakes offer stunning views and incredible landmarks during all seasons. Every season has its unique charm, unique colors and sounds. Spring has the highest flow waterfalls and you can see snow melting down. Some parts of the Park can be closed due to high water in this part of the year. Summer is still the most popular time for visitors. 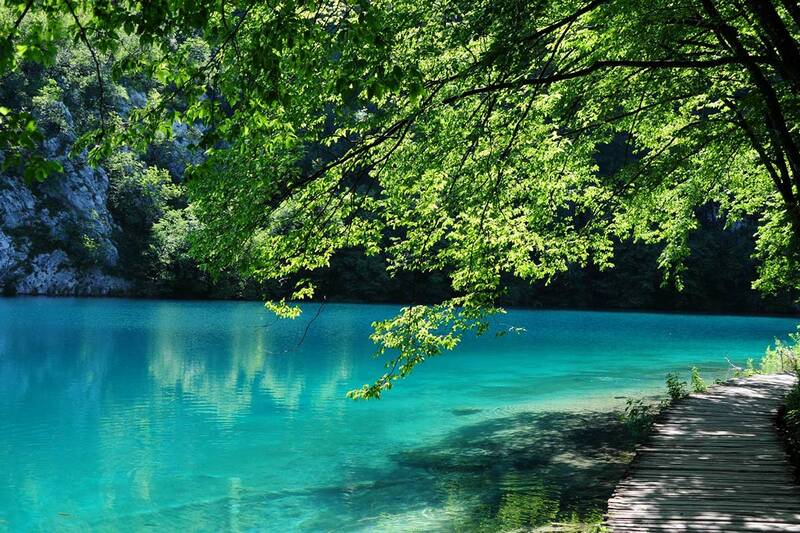 All the lakes are attractive with its emerald green and blue color depending on the intensity of sunlight. Most of the visitor find Plitvice lakes during the summer season as a escape from the city crowd and high temperature. Fall brings changing colors of the leafage and offers completely different color palette. Some of the lakes and waterfalls may be frozen during the winter but it is still a real winter fairy-tale. 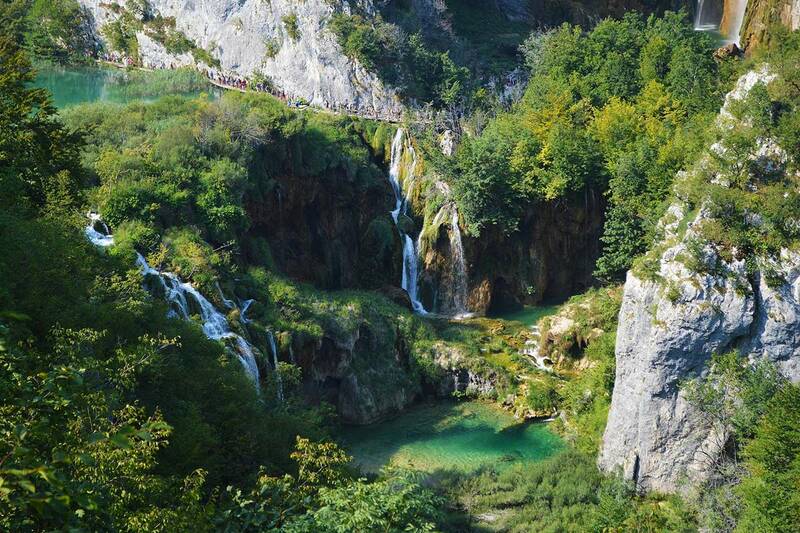 Plitvice lakes will surely spoil you with its beauty no matter which time of the year you decide to visit the Park. Even if they are covered by snow and ice or sunlight they will leave you speechless and with extraordinary impression. When to visit Plitvice lakes? Whenever you are in Croatia! National Park is always good idea for family trip. Beautiful nature, fresh air, emerald water and walking through the pathway really is the best choise to avoid city crowd. Most of the trails are quite easy. You just need to be careful with your children’s exploring too close to the edge of the bridges and trails. Some of the pathways are built without any kind of barrier so hold their hands in this part of the Park and you will surely enjoy the rest of your tour. Thinking about taking baby prom on the tour? We do not recommend. You can take it with you and leave it in our vehicle but bringing it inside the Park is not such a good idea. Wooden paths are uneven and rustic, in some parts of the Park water can cross the paths, depends on the season. There are also few stairs so accept our tips and make your trip with children more enjoyable. If you have small child bring your baby bjorn with you. That would make things easier. 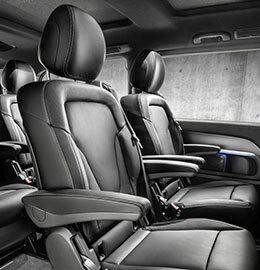 We are also providing child seat in our luxury vehicle so you don’t need to worry about this part of the tour.